Australian funnel-web spiders (family Hexathelidae, subfamily Atracinae, genera Atrax and Hadronyche) are among the most venomous spiders in the world based on clinical experience in Australia, [1, 2] although their importance to human health is limited by their confined geographic range. Funnel-web spiders belong to the suborder Mygalomorphae, a primitive group of spiders that also includes tarantulas. Funnel-web spiders of medical importance comprise 40 species within 2 genera, Atrax and Hadronyche, in the family Hexathelidae, subfamily Atracinae. The Atrax genus contains 3 species, including Atrax robustus, the Sydney funnel-web spider. The remaining 37 species are members of the genus Hadronyche. Funnel-web spiders are primarily found on the eastern coast of Australia. Related funnel-web spiders can also be found in New Guinea and the Solomon Islands. Funnel-web spiders are medium-to-large robust spiders that tend to be dark or black in color. These spiders measure up to 5 cm. They have stout legs and prominent fang-bearing chelicerae that deliver a neurotoxic venom. The common name derives from the funnel-like entrance to silk-lined subterranean burrows built by both males and females. The Sydney funnel-web spider (A robustus) is responsible for most reported envenomations and the only confirmed deaths in humans. 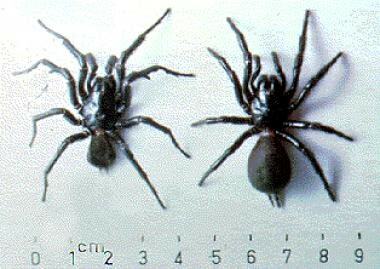 [4, 5] The Sydney funnel-web spider is shown in the image below. The Sydney funnel-web spider, Atrax robustus. Male (left) and female (right). Photograph courtesy of the Australian Venom Research Unit, Department of Pharmacology, University of Melbourne, Australia. However, bites from other funnel-web spiders, particularly the northern tree spider, Hadronyche formidabilis, are likely to cause serious envenomation syndromes and are potentially deadly if untreated. Delta-hexatoxin binds to the outer surface of tetrodotoxin-sensitive sodium channels. After binding, they induce excitability of these voltage-dependent sodium channels. The toxins also interfere with the conformational changes necessary for gating and inactivation of the channel. The ensuing massive neurotransmitter release results in an autonomic storm. The excessive release of endogenous acetylcholine, norepinephrine, and epinephrine is responsible for many of the clinical findings of funnel-web spider envenomation. Envenomation is heralded by substantial pain at the bite site. Most funnel-web spider bites do not proceed to severe systemic symptoms, causing only mild or local neurotoxic effects. In severe cases, the onset of symptoms is rapid, with a median onset of 28 minutes. Agitation and vomiting are common. Autonomic effects include diaphoresis, salivation, piloerection, lacrimation, and pupillary changes. Cardiovascular changes commonly include hypertension and tachycardia. Hypotension and bradycardia occur more rarely. Pulmonary edema can occur in severe envenomations, with dyspnea and pink, frothy sputum often accompanied by respiratory failure. Skeletal muscle fasciculation, muscle spasms, and oral paresthesias are frequent neurologic findings. Coma or loss of consciousness occurs in about 10% of patients who experience severe envenomation. Funnel-web spiders of medical importance are found in eastern and southern Australia. The Sydney funnel-web spider (A robustus) is distributed in a roughly 75-mile radius around the city of Sydney. Hadronyche species have a much wider distribution, from southeast Queensland to Victoria, Tasmania, and parts of South Australia. Bites are equally common in adults and children. However, envenomation in children is more severe because of the greater venom load per kilogram of body mass. Children may experience life-threatening envenomation within an hour of the bite and require immediate treatment. Only 1 in 10 people bitten by a funnel-web spider displays signs of envenomation; however, if envenomation occurs, mortality rates are high in patients who receive no antivenom treatment. Most patients who survive until antivenom can be administered are able to make a complete recovery. Deaths occurred in children and adult females with bites. In all cases where the spider was identified, the culprit was the Sydney funnel-web spider, A robustus. Severe envenomation, but not death, has been reported following bites by Hadronyche species. Isbister GK, Gray MR, Balit CR, Raven RJ, Stokes BJ, Porges K, et al. Funnel-web spider bite: a systematic review of recorded clinical cases. Med J Aust. 2005 Apr 18. 182(8):407-411. [Medline]. [Full Text]. Wong MKL, Woodman JD, Rowell DM. Short-range phenotypic divergence among genetically distinct parapatric populations of an Australian funnel-web spider. Ecol Evol. 2017 Jul. 7 (14):5094-5102. [Medline]. [Full Text]. Isbister GK, Fan HW. Spider bite. Lancet. 2011 Dec 10. 378(9808):2039-47. [Medline]. Al-Agroudi MA, Ahmed SA, Morsy TA. INTERVENTION PROGRAM FOR NURSING STAFF REGARDING APPROACH TO A PATIENT WITH SPIDER PHOBIA AND/OR BITE. J Egypt Soc Parasitol. 2016 Apr. 46 (1):167-78. [Medline]. Hedin M, Derkarabetian S, Ramírez MJ, Vink C, Bond JE. Phylogenomic reclassification of the world's most venomous spiders (Mygalomorphae, Atracinae), with implications for venom evolution. Sci Rep. 2018 Jan 26. 8 (1):1636. [Medline]. [Full Text]. Isbister GK, Gray MR. Bites by Australian mygalomorph spiders (Araneae, Mygalomorphae), including funnel-web spiders (Atracinae) and mouse spiders (Actinopodidae: Missulena spp). Toxicon. 2004. 43(2):133-40. [Medline]. Pineda SS, Wilson D, Mattick JS, King GF. The lethal toxin from Australian funnel-web spiders is encoded by an intronless gene. PLoS One. 2012. 7(8):e43699. [Medline]. [Full Text]. Windley MJ, Vetter I, Lewis RJ, Nicholson GM. Lethal effects of an insecticidal spider venom peptide involve positive allosteric modulation of insect nicotinic acetylcholine receptors. Neuropharmacology. 2017 Dec. 127:224-242. [Medline]. Graudins A, Wilson D, Alewood PF, Broady KW, Nicholson GM. Cross-reactivity of Sydney funnel-web spider antivenom: neutralization of the in vitro toxicity of other Australian funnel-web (Atrax and Hadronyche) spider venoms. Toxicon. 2002 Mar. 40(3):259-66. [Medline]. Miller M, O'Leary MA, Isbister GK. Towards rationalisation of antivenom use in funnel-web spider envenoming: enzyme immunoassays for venom concentrations. Clin Toxicol (Phila). 2016 Mar. 54 (3):245-51. [Medline]. Isbister GK, Gray MR. A prospective study of 750 definite spider bites, with expert spider identification. QJM. 2002 Nov. 95(11):723-31. [Medline]. Fisher MM, Carr GA, McGuinness R, Warden JC. Atrax robustus envenomation. Anaesth Intensive Care. 1980 Nov. 8(4):410-20. [Medline]. Sutherland SK, Duncan AW. New first-aid measures for envenomation: with special reference to bites by the Sydney funnel-web spider (Atrax robustus). Med J Aust. 1980 Apr 19. 1(8):378-9. [Medline]. Female funnel-web spider. Image courtesy of Glenn DuBois, CEO, http://www.termite.com/spider-identification.html. Male funnel-web spider. Image courtesy of Glenn DuBois, CEO, http://www.termite.com/spider-identification.html. The authors and editors of Medscape Reference gratefully acknowledge the contributions of previous author, Simon G A Brown, MBBS, PhD, FACEM, to the development and writing of this article.